p(x) = 0, then it is known as Quadratic Equation. Let x = α where α is a real number. If α satisfies the Quadratic Equation ax2+ bx + c = 0 such that aα2 + bα + c = 0, then α is the root of the Quadratic Equation. As quadratic polynomials have degree 2, therefore Quadratic Equations can have two roots. So the zeros of quadratic polynomial p(x) =ax2+bx+c is same as the roots of the Quadratic Equation ax2+ bx + c= 0. In this method, we factorise the equation into two linear factors and equate each factor to zero to find the roots of the given equation. Step 1: Given Quadratic Equation in the form of ax2 + bx + c = 0. Step 2: Split the middle term bx as mx + nx so that the sum of m and n is equal to b and the product of m and n is equal to ac. Step 4: Now we have to equate each factor to zero to find the value of x. 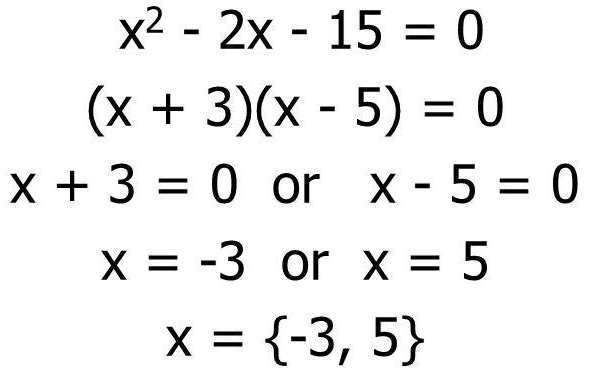 These values of x are the two roots of the given Quadratic Equation. In this method, we convert the equation in the square form (x + a)2 - b2 = 0 to find the roots. Step1: Given Quadratic Equation in the standard form ax2 + bx + c = 0. Step 4: Now write LHS as perfect square and simplify the RHS. Step 5: Take the square root on both the sides. Step 6: Now shift all the constant terms to the RHS and we can calculate the value of x as there is no variable at the RHS. where a, b and c are the real numbers and b2 – 4ac is called discriminant. To find the roots of the equation, put the value of a, b and c in the quadratic formula. 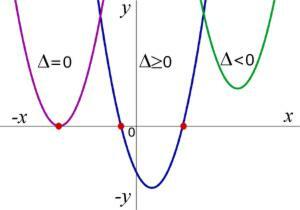 The nature of the roots of the equation depends upon the value of D, so it is called the discriminant.